In his video piece "The Documentary's New Politics," Eric Faden traces the rise of documentary film and the multiple events coalescing in its recent box office popularity: the trend of reality television as studios attempted to shield programming from writers' strikes (both threatened and actualized); the understanding of its generic conventions arising from 'mockumentaries' most prominently popularized by Christopher Guest; and the imbrications of digitally advanced graphics and high definition film which rivaled those of Hollywood blockbusters. In sum, documentary film is a significant mode for the expression of information that has heretofore been confined to books and magazine exposé. Focusing on Michael Moore's Fahrenheit 911, which does not use original footage but rather appropriated materials, Faden comments upon the lack of critical engagement with the form of the film, even as many attacked Moore's bias. As this clip from Faden's piece shows, the one critic who engages the form of the film, Dave Kopel, notes Moore's bias but argues that it comes from the fact that Moore's voiceover accompanies a particular choice of footage that is not related, and forms an inferred argument though Moore has technically told the truth. Faden notes, "For Kopel, the film equals a deceit because viewers are unable to read the complex visual syntax of the film." 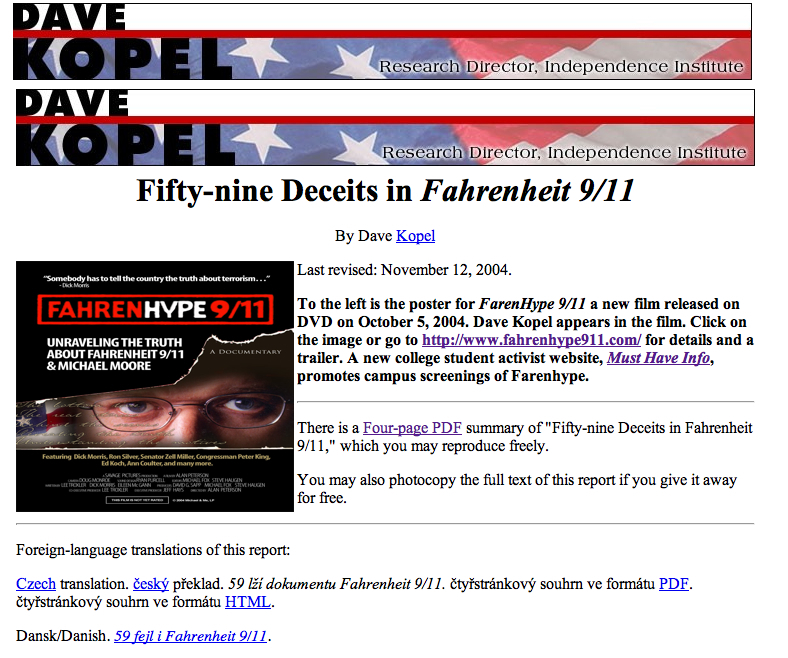 Although Faden does not agree with Kopel's general analysis (see Kopel's Fifty-nine Deceits in Fahrenheit 9/11), his singular response reveals "a crisis of criticism, a crisis of media literacy." Indeed, the ability to layer images with voiceover, text, music and other visual effects, renders the visual and aural syntax of such films impossible to decode without specific emphasis on the form as well as the content of the argument. Gauging the veracity of these filmic texts becomes a hit-or-miss endeavor. This fact, above all, argues for using film footage as course texts in university classrooms. For if public knowledge is increasingly expressed in film, and if documentary as well as broadcast media continues to apply cinematic devices which are multi-layered and digitally altered, then the complex syntax of these filmic texts must be a matter of widespread concern. Its literacy must be taught if its veracity is to be gauged. The field of film studies offers incredibly savvy strategies for critical film analysis and the importance of this work simply cannot be overstated in a world that is increasingly mediated by filmic text. Still, assessing the constructed nature of these filmic texts is difficult to do when one has not been forced to make the same rhetorical choices the creator has made. The ways in which voiceover impacts the images it accompanies, the ways that sound and timing and movement can shape the argument is best understood by deconstructing the piece and constructing a similar one. In doing so, one complicates the idea that purely objective texts, whether in word, image, sound or some mixture, ever exist. This is not to say that anything goes and that all knowledge is negotiable. A pedagogy of the Fifth Estate does not champion objectivity but calls it into question while applying scholarly practices of depth and rigor. As such, it retains the best elements of academia, while updating their relevance to our current multimedia environment. Discussion of "The Syntax of Documentary"
Version 30 id 8249 of this page, updated 03 May 2011 by Virginia Kuhn. Created by Virginia Kuhn.